Finding an effective treatment for skin infections in dogs can take many expensive trips to the vet with even more expensive treatments, with no end in sight to your pet’s discomfort. Not anymore. 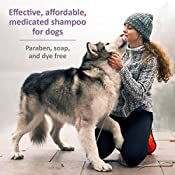 Veterinary Formula Clinical Care Antiparasitic and Antiseborrheic Medicated Shampoo for Dogs is an effective and affordable treatment for skin scaling caused by seborrhea, mange and other parasitic infections, and fungal and bacterial infections. 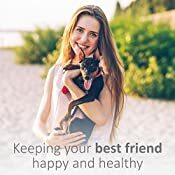 With an easy treatment regimen of shampooing 2-3 times per week initially and then less frequently as skin improves, you can give your pet relief from hair loss, flaking skin, red skin rashes, inflamed scalp, greasy or waxy skin, itching, thick crusted skin, foul odor, ear infections, and hot spots. The veterinary-grade ingredients in our topical 16 oz. 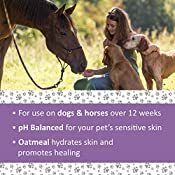 bottle of Antiparasitic and Antiseborrheic Medicated Dog Shampoo are proven to treat, hydrate and heal multiple skin conditions such as dermatitis, mange, seborrhea, parasitic and bacterial infections. Powerful medications salicylic acid, coal tar and micronized sulfur treat the infection, while colloidal oatmeal and allantoin hydrates skin and promotes healing. The spray is veterinarian recommended, safe, paraben, dye and soap free, and great for dogs with sensitive skin. 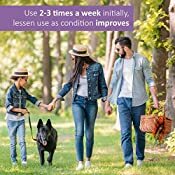 You can also use it with other topical spot-on flea and tick treatments. 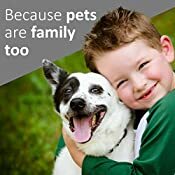 We know that your dogs are more than just pets - they are part of the family - so Veterinary Formula Clinical Care designs premium medicated products that pet parents can actually afford. 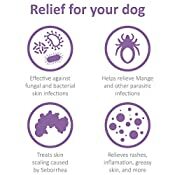 Your dog will feel fast acting relief from skin infections and you will notice that your dog’s skin is calmer, less inflamed and the itching is controlled – making you both happy and able to focus on more important things like walks, fetch and snuggles. Of course, it’s important to determine the cause of the underlying issue, so please consult your veterinarian if skin issues become a consistent problem. Due to the coal tar content of this shampoo, we do not recommend its use on cats.